DCWatch is an on-line magazine that covers local city politics and public affairs in Washington, D.C. In addition to articles and columns about political issues and politicians, DCWatch features resources for civic activists and background material on legislation and current events in the District of Columbia. Click here to access past issues and the latest issue of themail. To search the DCWatch web site, use the box below, and check “search dcwatch.com” to limit your search to the DCWatch site. For current news about DC schools, visit DCPSWatch.com. 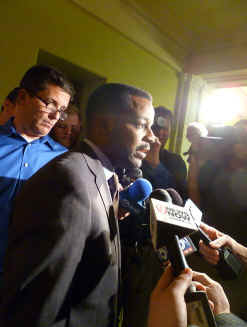 US ATTORNEY RON MACHEN, CRIMINAL INFORMATION AGAINST HARRY THOMAS, JR., January 5, 2011. Plea agreement of Harry Thomas, Jr., December 23, 2011. Statement of the offense, December 23, 2011. Resignation statement of Harry Thomas, Jr., January 5, 2012. Resignation letter, January 6, 2012. US Attorney Ronald Machen, press release on guilty plea by Harry Thomas, Jr., January 6, 2012. FBI press release on guilty plea, January 6, 2012. DC ATTORNEY GENERAL, COMPLAINT AGAINST COUNCILMEMBER HARRY THOMAS, JR., June 6, 2011. Settlement agreement between Harry Thomas, Jr., and Attorney General's office, July 22, 2011; consent motion between Harry Thomas, Jr., and Attorney General's office, July 22, 2011; press releases on settlement from the Attorney General, July 22, 2011, and Councilmember Harry Thomas, Jr., July 22, 2011. CLARUS POLL FOR SEPTEMBER PRIMARY: For mayor: Vincent Gray, 39 percent; Adrian Fenty, 36 percent. For council chairman: Kwame Brown, 39 percent; Vincent Orange, 29 percent. See the poll and fuller results from the poll. PRIMARY ELECTION POSITION PAPERS: Vincent Gray has issues position papers on education, July 1, 2010, and on jobs and economic development, August 4, 2010. BENNETT REPORT ON COUNCIL CONTRACTS AND GRANTS. On February 16, 2010, attorneys Robert S. Bennett and Amy R. Sabrin completed their seven-month investigation as Special Counsels to the city council. Their report on personal services contracts and earmarked grants by the council finds that Ward 8 Councilmember Marion Barry violated District laws and regulations and tried to impede their investigation. They recommend referral of the matter to the US Attorney and the DC Office of Campaign Finance for investigation of possible violations of law. See the Bennett Report and Chairman Vincent Gray's introduction. DISTRICT MASTER FACILITIES PLAN FOR FY2009-2013, listing District-owned and leased properties and the Fenty Administration's plans for them, released on June 10, 2009. Press release on the plan, June 10, 2009. FIRE TRUCK AND AMBULANCE DONATION TO SOSUA, DOMINICAN REPUBLIC — Peter Nickles, letter refusing cooperation with council investigation into donation, April 20, 2009; reply to Nickles from Councilmembers Mendelson and Cheh, April 21, 2009. Letter from Councilmembers Phil Mendelson and Mary Cheh to Mayor Fenty requesting information for an investigative hearing, April 9, 2009. Memorandum from Attorney General Peter Nickles and letters from Councilmembers Phil Mendelson and Mary Cheh requesting more information and an investigation from CFO Natwar Gandhi and Inspector General Charles Willoughby, April 3, 2009. ATTORNEY GENERAL PETER NICKLES commands the city council to change its law forbidding overnight releases from the city jail, and threatens not to obey it; Councilmember Phil Mendelson says he was “appalled” by Nickles’s letter, and reminds Nickles his job is to enforce the city’s laws, February 17, 2009. Nickles replies to Mendelson, February 24, 2009. Along with Nickles’ draft memorandum to Devon Brown, Director of the Department of Corrections, ordering him not to obey the city’s law on overnight jail releases, February 17, 2009. NICKLES REQUESTS SUBPOENA POWER FOR ATTORNEY GENERAL’S OFFICE, February 24, 2009. ATTORNEY GENERAL PETER NICKLES CONFIRMATION DISPPROVAL RESOLUTION AND COMMITTEE REPORT, November 17, 2008. The Judiciary Committee of the city council voted to disapprove Attorney General Nickles' confirmation and issued this comprehensive report detailing why it should not be approved. On November 18, the full council approved the nomination. PUBLIC CORRUPTION INVESTIGATION INTO PROPERTY TAX FRAUD — over $16 million, the largest theft in the history of the region, results in five arrests. See the US Attorney’s press release; Chief Financial Officer Natwar Gandhi’s press release, November 7, 2007; and the criminal complaint and affidavit against Diane Gustus, November 7, 2007. 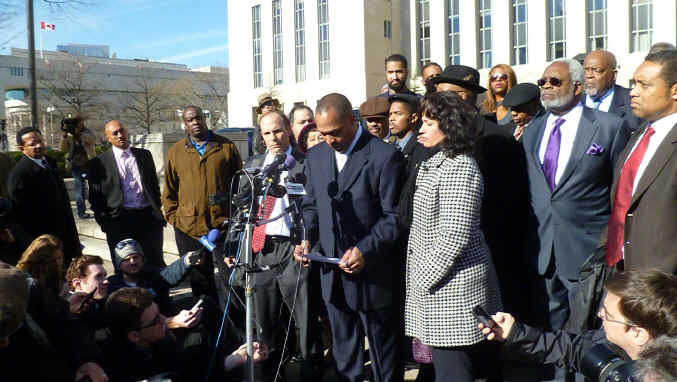 FENTY AND RHEE PROPOSE MASS FIRINGS AT DCPS — press release, October 12, 2007, and proposed legislation, the Public Education Personnel Reform Amendment Act of 2007. EMERGENCY MEDICAL TASK FORCE (the "Rosenbaum Task Force" issues its final recommendations, September 20, 2007; see also the summary of the recommendations in the press release. NEW DOCUMENTS: Saint Elizabeth's settlement agreement between the Department of Justice and the DC government, May 10, 2007; DC Department of Mental Health's summary of the Saint Elizabeth's agreement, May 10, 2007; the International Economic Development Council's report on the National Capital Revitalization Corporation and the Anacostia Waterfront Corporation, March 15, 2007; and the staff list for the Mayor's Office of Community Relations and Services, May 2007. THE MAYORAL TAKEOVER OF SCHOOLS -- "Referendum on Certain Provisions of the Public Education Reform Act of 2007," Referendum 007; Mayor's letter requesting to Board of Elections to reconsider its decision to approve the Referendum as a proper subject, May 31, 2007; Mayor's appeal to DC Superior Court, June 1, 2007. Enrolled version of DC Public Education Reform Amendment Act of 2007, Bill 17-001. Mayor Fenty's education transition strategy, April 27, 2007. US COURT OF APPEALS DECISION in DC's Second Amendment case, Parker v. District of Columbia, and press releases by Mayor Fenty, Delegate Norton, and the Cato Institute, March 9, 2007. District government's request for a rehearing en banc, April 9, 2007. DC TASK FORCE ON CONTRACTING AND PROCUREMENT TASK FORCE REPORT, December 4, 2006: " the problems in the procurement system are not as much in its laws, regulations and implementing procedures, as in the commitment of the government to follow them." DC COURT OF APPEALS REJECTS SLOTS INITIATIVE AS A PROPER SUBJECT FOR AN INITIATIVE — The implication of the decision is that gambling promoters cannot establish a slots casino in the District of Columbia unless the US Congress first amends the federal law that prohibits gambling devices in DC. November 22, 2006. ADRIAN FENTY: “Pre-transition” task force reports, November 6, 2006; transition plan, November 8, 2006; appointment of Tene Dolphin as future Chief of Staff and Dan Tangherlini as future City Administrator, November 8, 2006; Linda Singer as future Attorney General and Peter J. Nickles as General Counsel, November 10, 2006; and Neil Albert as Deputy Mayor for Planning and Economic Development and Carrie Brooks as Director of Communications, November 13, 2006. DOUGLAS JEMAL FOUND GUILTY OF ONLY ONE COUNT OF WIRE FRAUD, see the prosecution’s outline of the acts it views as part of the criminal conspiracy, October 15, 2006, and the original indictment, September 27, 2005. OLD CARNEGIE CENTRAL LIBRARY now proposed by mayor to replace the Martin Luther King, Jr., Central Library -- see the EDAW feasibility study (in PDF format), June 2006 and other materials on the library controversy. DC PUBLIC SCHOOLS ANNOUNCES FIRST ROUND OF SCHOOL CLOSINGS, MAY 15: DCPS press release, Superintendent Janey's recommendations; and one-page summary of recommendations. 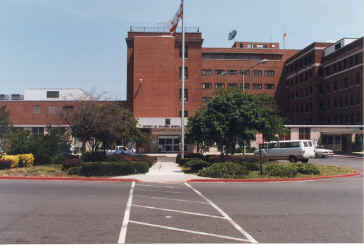 NATIONAL CAPITAL MEDICAL CENTER: The Chief Financial Officer's analysis of the project, May 5, 2006. The Exclusive Rights Agreement signed between Howard University and Mayor Anthony Williams on January 5, 2006, plus Howard University’s description of the NCMC. THE VIDEO LOTTERY TERMINAL GAMBLING INITIATIVE OF 2006, another attempt to establish a slots casino in DC, was filed with the DC Board of Elections and Ethics on March 14, 2006; a slightly revised version was filed on April 10, 2006. For more information on DCWatch, go to What Is DCWatch?